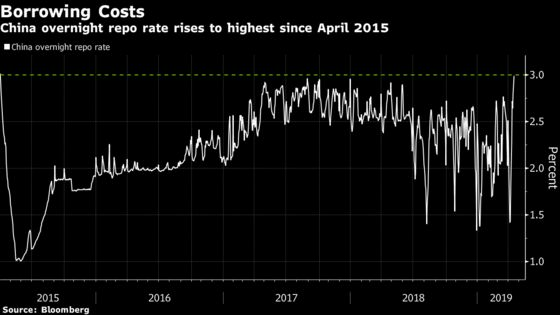 (Bloomberg) -- The overnight borrowing cost in China’s money market rose to a four-year high as cash supply tightened just as tax payments increased demand for liquidity. The overnight repurchase rate rose as much as 11 basis points to 3.0006 percent, the first time it’s reached that level since April 2015. The measure pared the gain to 2.9974 percent as of 3:20 p.m. in Shanghai. It has jumped 35 basis points in three sessions, and is higher than the seven-day rate, which fell to 2.7905 percent. The People’s Bank of China rolled over about half of the funds coming due through one of longer-term policy tools Wednesday, while offering 160 billion yuan ($23.9 billion) of seven-day money via open market operations. April and May are a peak time for tax payments, which may total 500 billion yuan, according to Hua Tai Securities Co. The rise in the overnight rate shows “tighter liquidity conditions amid the bullish China stock market,” said Ken Cheung, a senior Asian FX strategist at Mizuho Bank Ltd. It may be rising faster than the seven-day rate because of tax payments that might be due in the coming days, he said. Gross domestic product rose 6.4 percent in the first quarter from a year earlier, surpassing economist estimates and matching the previous three months. In March, factory output jumped 8.5 percent from a year earlier, much higher than forecast. Retail sales expanded 8.7 percent, while investment was up 6.3 percent in the year to date. "Looking from a broad perspective, the central bank intends to tighten marginally and the probability of a reserve-requirement ratio cut is now lower,” said Qi Sheng, chief fixed-income analyst at Zhongtai Securities Co.